"You should always make the best out of everything that comes your way." Christine Raab (35) is a freelance makeup artist. She was diagnosed with breast cancer in November 2014. This was followed by many investigations and an operation during which the affected lymph nodes were removed. After the follow-up chemotherapy, Christine Raab developed lymphoedema. Since then she has been wearing a compression sleeve at work and in her private life. Christine Raab is convinced "you should always make the best out of everything that comes your way". Her positive attitude gives other women hope and courage. You were diagnosed with breast cancer in November 2014. How did that come about? "More or less by chance. My husband discovered a lump in the breast. My first thought was: that's only a cyst that will go away on its own. I got an appointment with my doctor very quickly. While she was palpating the breast, I could see from her expression that it could be something she hadn't expected. The results of the ultrasound scan also gave her cause for concern, so she ordered a mammography. That was the first time I cried. It took about a week for the results of the mammography to arrive, but I didn't find the waiting so bad. On the contrary, I thought: so long as nothing's been discovered, I can carry on with my daily life". "After the mammography, they took a biopsy to find out exactly what the lump was. Another few days passed until the laboratory results came through. Then came the moment that the hospital's breast centre told me it was breast cancer. I just sat there and said "No, that can't be true" and I cried. The doctor then said it would be best to start chemotherapy straight away". The diagnosis was no doubt a shock for you. "When I heard the word "chemotherapy" all those typical pictures immediately shot through my head. That your hair falls out and you look kind of ill. I didn't think about having cancer and that I could theoretically die, I just thought about all the other associated things. Once the diagnosis had been made, I had follow-up tests to see if metastases had formed anywhere. Due to my age, they also recommended that I seek advice from a family planning clinic, because this treatment sometimes means you can't become pregnant by natural means". At that time you were already working as a self-employed makeup artist. The breast cancer diagnosis must have caused some disruption. "Yes, that's right. At the time I was also working as a trained nursery nurse, on a self-employed basis too. I held swimming classes for children and organised childcare for events. During that time, I had many doctors' appointments, which I also had to squeeze into my full agenda, so I initially stopped the swimming classes and the childcare and employed a member of staff to look after those". "I informed the parents of my swimming classes personally. It wasn't easy to talk openly about the diagnosis. That somehow made it all so real. Of course they were all shocked. After I had told the parents, I made a video, in which I talked about my breast cancer diagnosis. I published the video on YouTube and shared it on Facebook, so I didn't have to tell each of my contacts, family and friends individually". When did the chemotherapy start? "They planned to start the chemotherapy on 2 January 2015. The lymph nodes on the right side were removed in the weeks before Christmas, because they were also affected. A port catheter was also implanted that was needed for the chemotherapy. And, parallel to all this, I was having treatment at the family planning clinic. Shortly before Christmas all the preparations were complete and I was able to recuperate in the arms of my family before the New Year. The chemotherapy started at the beginning of the year as planned. Every three weeks came the next dose, six in all". When did you notice that lymphoedema had formed? "Some time after the chemotherapy, I was driving the car and noticed that my right arm was really thick. I had met patients at the hospital, who had told me about their lymphoedema. So I naturally went to the doctor's surgery straight away. They quickly found that I had lymphoedema and they gave me a prescription for lymphatic drainage". You now wear a compression sleeve. Can you explain how it works? "At the outset, when the arm is really thick, they work with gauze and inelastic bandages. These are applied very tightly using a special technique, so that the lymph fluid is squeezed out by the pressure. The compression sleeves work on the same principle. Once the bandages have made the arm relatively thin again, you go to a surgical appliance retailer, who measures you for a compression sleeve". What happens, if you leave the compression sleeve off once in a while? "One or even two days without a sleeve isn’t really bad for me. But it always depends on the severity of the lymphoedema and on the situation. In summer, you are more likely to accumulate lymphatic fluid, but it’s different in winter. Principally, everything that constricts the arm is bad, because it impedes lymphatic drainage. For instance, you should be careful with bras, heavy shoulder bags and the like. That's why I personally find it easier to wear the sleeve all the time, because then I don't have to pay attention to so many things". Is there anything else, whereby the sleeve restricts you? "Not really. It enables me to spend my days perfectly normally. Without it, my lymphoedema could be quite painful. The bandaging techniques wouldn't be a long-term alternative. You can compare it with having a plaster cast on your arm. You can hardly move the arm and the tight bandages are painful. I wouldn't be able to work at all. So the sleeve makes my entire day-to-day life much simpler". Your job means you are in contact with a lot of people. Are they curious? Do they ask a lot of questions? "Of course the children ask what I'm wearing on my arm. So I explain to them the best I can what a sleeve is for. I'm also asked a lot during my makeup appointments. Depending on the situation, I tell them about lymphoedema and how it came about. Many clients are initially a bit shocked, because they didn't really want to address such a serious subject. But I don't find it bad at all". As a makeup artist, you have a lot to do with the subject of beauty. Has your attitude towards beauty changed? 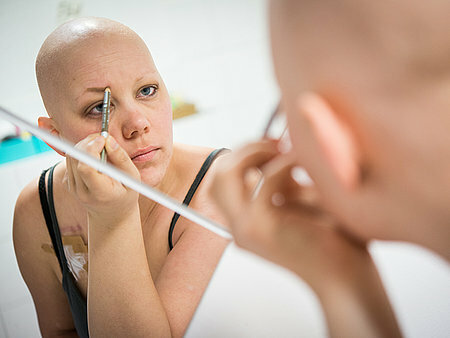 "During the first week of chemotherapy I absolutely refused to look in the mirror. I slowly began to feel better in the second week and started putting on makeup again. This had a positive effect on my personal well-being. You look in the mirror and you no longer look so ill. Even my bald head was no longer that bad. I simply replaced the eyebrows and eyelashes that had fallen out. You can convince yourself: ‘I look good, so I feel good too’. I made videos about this and published them on YouTube". 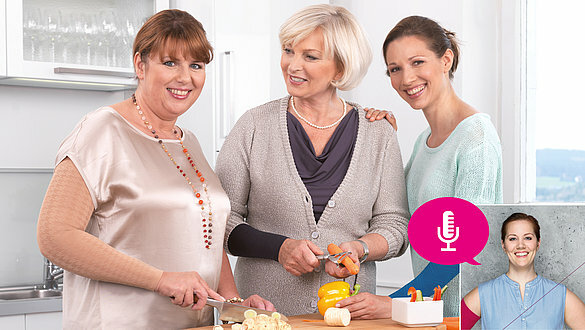 What would you like to say to other women with similar illnesses? "That's easy: no matter how bad the situation is, you just have to make the best of it"! 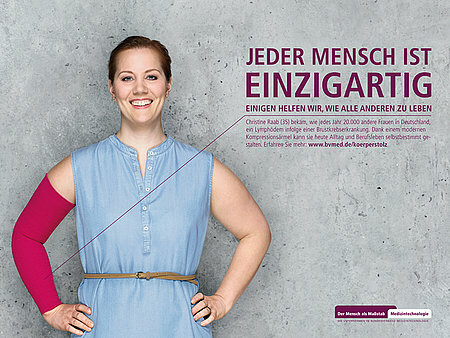 Christine Raab (35) wants to take part in the BVMed [German Medical Technology Association] campaign "Body Pride" to give other women hope and courage with her positive attitude. The aim of "Body Pride" is to deepen understanding for the situation in life of those affected and to illustrate the importance of medical devices for a self-determined and active life. The motto is: "Everybody is unique. Some need our help to live their lives like everyone else". For further information visit: www.bvmed.de/einzigartig. 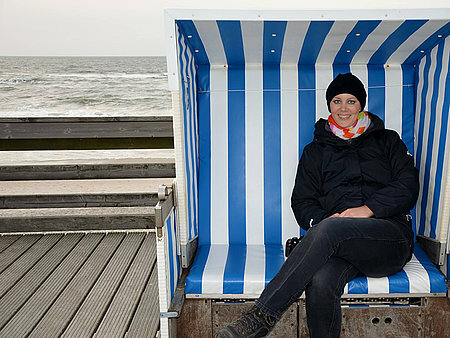 Just like 20,000 other women in Germany, Christine Raab developed lymphoedema following breast cancer. Thanks to a compression sleeve, she can now organise her job and shape her day-to-day life exactly as she wishes.